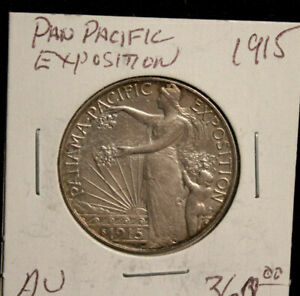 Note: See information on counterfeit Panama-Pacific International Exposition Half Dollars. Today, more than eighty years after the Panama Canal was completed, it remains one of the engineering marvels of the modern age. It took ten years and 375 million dollars to complete, and when the S.S. Ancon sailed from the Atlantic to the Pacific Ocean on August 15, 1914, there was cause for great celebration. To commemorate the canal's completion, Congress authorized the Panama-Pacific International Exposition. Before it was over, more than 50 million dollars went toward making it the greatest fair in American history. Held in San Francisco, the exposition was secondarily a celebration of that city's recovery from the devastating earthquake of 1906. Congress also authorized a series of commemorative coins to mark the occasion: a half dollar, gold dollar, quarter eagle and two fifty-dollar gold pieces. 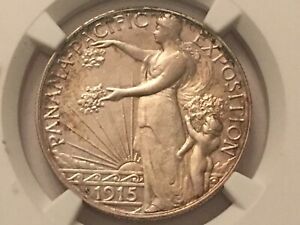 Although the exposition was scheduled to open February 20, 1915, the bill authorizing the coins was one of the last approved: it wasn't signed until January 16, delaying production of the coins until the exposition was in its third month. 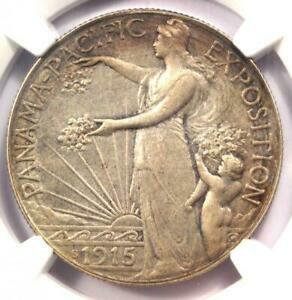 Initial plans called for Paul Manship, a noted sculptor and medallist, to design the half dollar. However, sometime in early February, Secretary of the Treasury William McAdoo was persuaded (probably by Chief Engraver Charles Barber) to keep the design of the half dollar and quarter eagle within the Mint. The result was a coin with the obverse designed by Barber and the reverse allegedly fashioned by his assistant, George T. Morgan. Curiously, neither engraver's initials appear on the coin. Both Barber and Morgan had been in the engraving department of the Mint since the 1870s, but neither had participated in the artistic renaissance begun by Theodore Roosevelt in 1907. In fact, Barber continually blocked the designs of outside artists, zealously promoting his own static, 19th-century ideas. 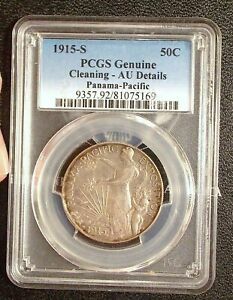 However, with the obverse design of the Panama-Pacific half dollar, he uncharacteristically produced an aesthetically notable work. 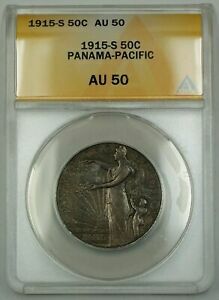 As with all four designs in the Panama-Pacific series, Barber's obverse is highly symbolic. The figure of Columbia is seen scattering flowers from a cornucopia held by a cherub, or naked child. The cornucopia represents the abundant resources of the West, and the rays of the sun, wave motif and north and south sides of the entrance to San Francisco Bay are clearly suggestive of a Golden Gate to the West. Encircling the periphery is the inscription PANAMA-PACIFIC EXPOSITION. The San Francisco mintmark (S) is located to the left of the date. For the reverse, Morgan did little more than modify the eagle used on the silver dollar first struck in 1878. The bird is perched on top of the Union shield. To its left is an oak branch, symbolizing stability, and to the right is an olive branch, symbolizing peace. The legends UNITED STATES OF AMERICA and HALF DOLLAR surround the border, while the motto IN GOD WE TRUST appears above the eagle. 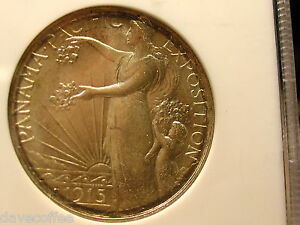 The olive branch of peace is particularly ironic on a coin struck the year after World War I broke out. Undoubtedly, it reflects America's peaceful but naively isolationist view of a conflict that in 1915 was still confined to the nations of Europe. 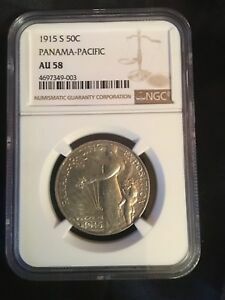 The distribution of Panama-Pacific half dollars, as well as the other three denominations, was handled largely by Farran Zerbe, a past-president of the American Numismatic Association (1907-1909) and self-styled promoter of numismatics. Zerbe toured throughout the country with an exhibit called "Money of the World." At the exposition, his exhibit was part of the Coin and Medal Department, but he supervised the entire display. 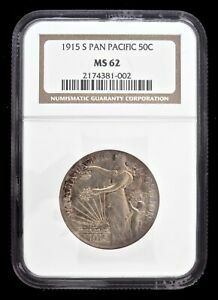 Zerbe enthusiastically marketed the Pan-Pac coins, and at a dollar apiece, 40,000 half dollars were sold before striking officially began. He offered a variety of quantities and presentation sets, some in frames, some in custom leather cases, including a $7.50 cased version that contained the smaller denominations of half dollar, gold dollar and quarter eagle. Always the promoter, Zerbe included a letter from San Francisco Mint Superintendent T. W. H. Shanahan certifying the striking sequence of the three coins. Very few of these original groupings remain intact today. 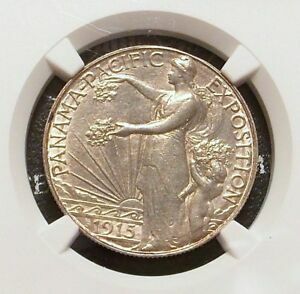 By the close of the exposition, Zerbe offered the three lower denomination coins in larger quantities and at lower prices. While a maximum issue of 200,000 half dollars was authorized by Congress in January, at the close of the exposition on December 4, only 60,030 pieces had been struck (which included 30 pieces struck for assay). Of these, 32,866 unsold pieces were melted, resulting in a net mintage of 27,134. 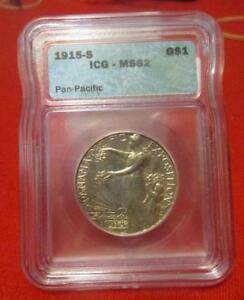 Although a few varieties exist of the Pan-Pac half, only the one with a double punched mintmark is reasonably obtainable. Others reported are two satin finish proofs, one matte proof and trial pieces lacking the S-mintmark struck in copper, silver and gold. 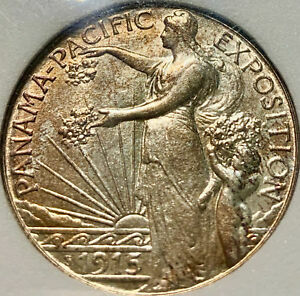 Pan-Pac half dollars are among the most popular issues in the entire commemorative series. 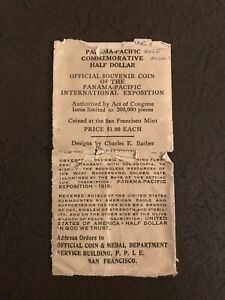 Unlike some of the later, blatantly commercial commemoratives of the 1930s, the Panama-Pacific Exposition was a significant event, and its coins are sought by many general collectors of U.S. coins. Most of the demand for this key issue, however, comes from those assembling 50-piece type or complete 144-piece date and mint silver commemorative sets of the 1892-1954 period. 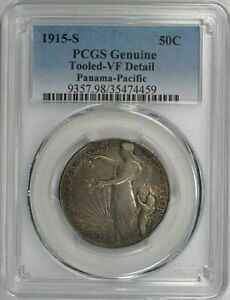 Circulated Pan-Pac halves are encountered with some frequency, as much of the surviving population is in XF-AU, having suffered abuse over the years from cleaning, whizzing or retoning. Mint state pieces are available in lower grades, but are quite elusive in MS 64 and above. 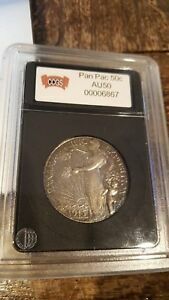 Pan-Pac half dollars generally come with satiny luster and a grainy surface texture, making them somewhat difficult to grade, especially for those accustomed to coins with a more frosted appearance. Many pieces have been cleaned, impairing, however imperceptibly, their natural luster. This makes them appear somewhat dull and lifeless, which is not the case for coins with choice, original surfaces. For this issue, perhaps more so than any other commemorative, an experienced third-party opinion is often necessary to determine whether a particular coin's surfaces are original or altered. Another problem with Pan-Pac halves is strike: Weakness is often evident on Columbia's head, cap, arm and body, also on the eagle's breast feathers and claws. Occasionally, coins are seen with a rim indentation near the periphery on each side; this is a mint caused problem and should not be factored into the grade. When grading lightly circulated examples, friction is first evident on Columbia's shoulder and on the eagle's breast. Recently, counterfeits have appeared; these display very sharp reeding, indistinct lettering and brighter-than-normal surfaces. 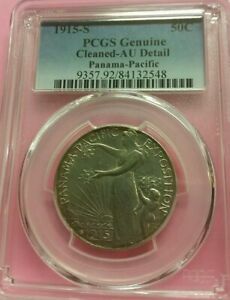 With high quality examples so elusive, the Panama-Pacific half dollar is among the most highly regarded of all U.S. commemoratives. Adding to its appeal are the many "firsts" associated with the issue. Pan-Pac halves were the first commemorative coins to depict Columbia (Columbian Exposition halves used a representation of Christopher Columbus) and the first to carry the motto IN GOD WE TRUST. They were also the first commemoratives struck at a branch mint. 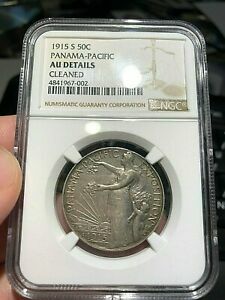 As such, Pan-Pac halves are a fitting tribute to two of the more memorable accomplishments of that era: the engineering wonder of the Panama Canal and San Francisco's successful rise from the ashes of 1906. 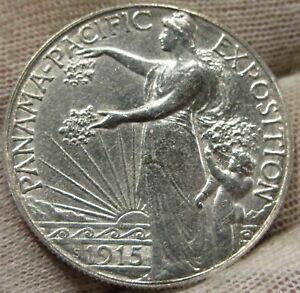 1915 S PANAMA PACIFIC EXPOOSITION COMMEMORATIVE SILVER HALF DOLLAR "AU"